Historians believe that America’s first log cabins were built almost 400 years ago. Log cabins have been constructed as houses and shelters for much longer in Europe, and when Europeans began to settle in America they brought their skilled craftsmanship and traditions with them. In particular, it was the Finnish and the Swedes who built the first American Log Cabins. The log cabin was suited to early settlers because of the vast amount of forestry, and the ease of building a log cabin. It wasn’t long before the technique was picked up by other settlers such as the Scots, Irish and Germans. Most of the very first log cabins, as you’ll see below, were very simple structures compromising of a single room, with one door and usually no windows. If windows were cut in the walls, they would have used animal skins or boards which would slide across to keep drafts out. You’ll notice that most of the early log cabins look different to the well refined, round logged cabins that we are used to seeing today. The logs used in early cabins were usually hewn to achieve flat walls; this made the appearance of the structure more house like, and also helped to withstand the elements, as all of the soft outer sapwood was removed. 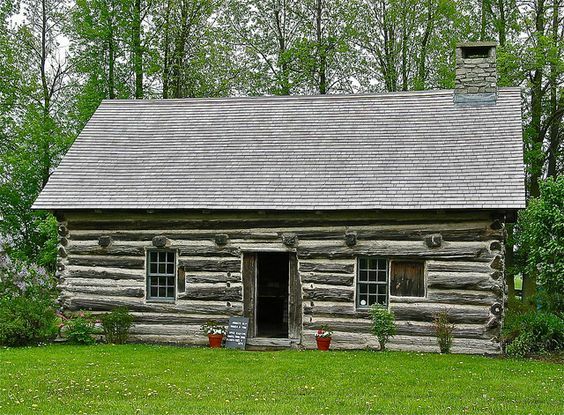 Let’s take a look at some of the oldest log cabins that are still standing in America today. This is the oldest log house in America, set just a few feet away from a busy road in Gibbstown, Gloucester County. The one bedroomed cabin is thought to have been built by Finnish immigrants. It has an asymmetrical fireplace which is typical of other Scandinavian cabins built during a similar time. The cabin has stood the test of time because it was built with Oak; a hardwood. It originally had a dirt floor but a sturdier floor was put in, in 1730. The cabin was built by a family who will have been relatively well off, judging by the size of it. It average size of a cabin during that time period was 12×12 feet, however Nothnagle Cabin is 16×22 feet. On the side wall, there are two logs that are removable, so that they could be removed during summer to cool the cabin down. Since 1973, Doris and Harry Rink have lived in an 18th century house attached to the cabin. The cabin is currently for sale for the first time in almost 50 years, for $2.9 million. Built just a couple of years later, the Lower Swedish Cabin is bblocated in Pennsylvania. This two storey cabin was built by Swedish immigrants, and it is one of the last of its kind still standing – a true testament to the ingenuity and craftsmanship of America’s early settlers. It was originally used as a trading post to trade tools, fur and native crafts with local Indians. The cabin was then used by other settlers throughout the 18th and 19th centuries, before Siegmund Lubin, a film pioneer used the cabin for early motion pictures from 1904 to 1906. The cabin was then used for Girl Scouts meetings, and then abandoned where it fell subject to vandalism during the mid-1900’s. The building was later restored in 1987 and is now a designated National Historic Landmark. The William Smith House, also known as Brookes, is a walnut log cabin built in 1686 by William Smith; an English Quaker from Yorkshire. 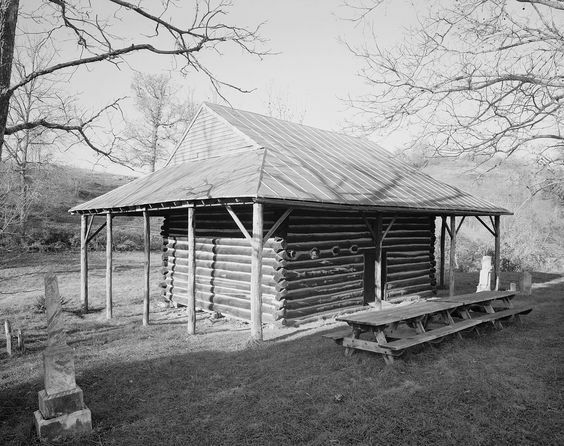 When he finished his four year service as a servant to the governor, he moved to Wrightstown, Pennsylvania, where he was only the second white inhabitant, and built this log cabin. Originally it was a two story log cabin, and in 1690 the owner and builder decided to add a fieldstone structure to the side of the cabin in order to provide another small room. Two more additions were added in 1965 and then again in 1968, in keeping with the same style as the original house. The log cabin is not particularly detailed or beautiful, it was made using many different sized and uneven logs, however the method used created a sound and study building which has stood the test of time. 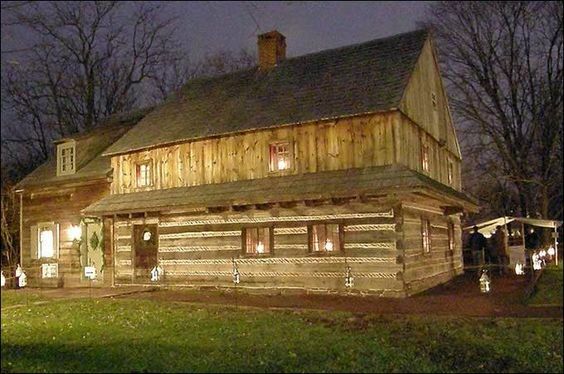 Morgan Log House is the oldest surviving two and a half story log home in America. Records of the land upon which this Log Home sits on stretch back to 1702, where 600 acres were granted to a merchant – Griffith Jones. In 1708, Edward Morgan, a Welsh man, bought half of the land and the deed showed an unspecified ‘dwelling house’. The house has been sold numerous times since then, and currently sits on 1.718 acres of land. Ownership currently lies with Towamencin Township who bought it shortly after it was designated a public recreational area in 1968. The Towamencin Historical Society was then founded with the purpose of restoring and researching the site. They found that the house was Germanic and therefore any restorations were made accordingly, the home retains 90% of its original materials. The Morgan Log House is now on the National Register of Historic Places and now operates as a historic house museum. Hyde Log Cabin is the oldest log cabin in Vermont. It was built by Jedidiah Hyde, using cedar logs that were harvested on the island. Jedidiah Hyde was one of the first people to build along the shores of Vermont’s Lake Champlain. The family stayed in his cabin for 150 years. The single story cabin is 20 x 25 feet and was constructed from peeled cedar logs. Inside the cabin is one single room with a loft space above. In the 1940’s the cabin was scheduled for destruction, but it was met with much opposition, and the Vermont Historical Society fought to save it. In 1946, the cabin was moved a few miles away and now, the Grand Isle Historical Society provide tours during the summer months. The current guide, Charlene Southwick makes it her mission to provide visitors with an accurate representation of what life would have been like. She sews her own period clothes and wears them when giving tours. Construction of the Rehoboth Church, a Methodist church built by early settlers in West Virginia began late 1884. Only medium sized logs were used to build the church and its thought that it only took a few days to harvest the logs and build the structure. The interior of the church is very simple, and is dominated by a raise pulpit also made from wood harvested from the local area. The only other furnishings in the church are the pews which are also very simple, half-sawn logs, wooden lamp stands and an altar. The building is so small (only 21 x 29 feet) that in July 1788, Bishop Asbury preached a sermon standing in the door of the church, while the crowd gathered outside to listen. The church deteriorated over the years and restoration finally started in 1927. The whole church was repaired. The original roof was left in place, but to offer more shelter, a large tin roof was place on top of the roof. Rehoboth Church is the oldest Methodist church in America and although it is no longer used for services, it does open its doors for special occasions. The Church has been in the National Register of Historic Places since 1974, and if you want to visit, you can expect to learn much about the history of Christianity as well as the history of the nation. Although slightly older than the other cabins we’ve looked at, the Molalla Log House has some fascinating history behind it. The very essence of this home questions the entire history of Oregon, because if expert theories are correct, this Log Home predates the start of the American explorers, Lewis and Clark’s 1804 expedition by almost a decade. For 6 years, architectural historian Pam Hayden and pioneer restoration expert Gregg Olson have been trying to untangle the mysteries, and it is possible that the Russians may have beat America in settling Oregon. One theory suggest that Molalla Log House was built by Russian craftsmen who were sent by Catherine the Great to settle, and its construction is unlike anything Oregon has ever seen. There are pencil marks which reveal an ingenious numbering system too. The logs fit together so perfectly that there was no need for chinking and the woodwork was more like that of an extremely skilled cabinet maker than of a settler’s cabin. In 1892, Mololla Log House was taken apart and reconstructed on another site, it was used as a house, an animal shelter, a machine shed and the Fox Granary, and it was then disassembled once again and moved into storage. 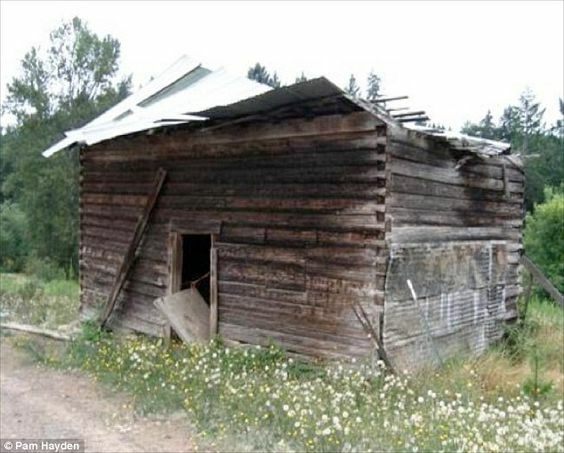 The Molalla Area Historical Society are currently looking for a suitable place to re-site it, in the meantime though, it is being heavily studied to try and find out who built what could be Oregon’s oldest structure, and why. You may notice a common theme running throughout all of America’s oldest log cabins – they were all extremely well crafted, and made from hard woods such as oak and walnut. The majority of them are made from hewn logs and it’s thought that this technique helps to make them more weather resistant because most of the sapwood is removed leaving the solid heartwood which is much less prone to rotting. For those of us who live in log cabins or want to live in log cabins – it’s also testament to how long they can last for, as long as they are built and maintained properly. Do you know of any other old log cabins? Perhaps there is one in your local area? Next time you drive past, maybe you won’t look so fleetingly at it, maybe you’ll think about the history and the people that built it all that time ago, and how incredible it is that it’s still standing today. We’d love to hear about any old cabins in your area, let us know below. Regarding that last point, as a native Oregonian I can tell you that shelters and cabins built in the style of the early from-the-Eastern-USA pioneers do not last.